Home BUSINESS MTAANI NEWS DOUBLE TRAGEDY! Trader loses shop, house to two simultaneous fires. DOUBLE TRAGEDY! Trader loses shop, house to two simultaneous fires. Some of the traders affected by the Tuesday night fire assess their losses as they ponder the next cause of action. 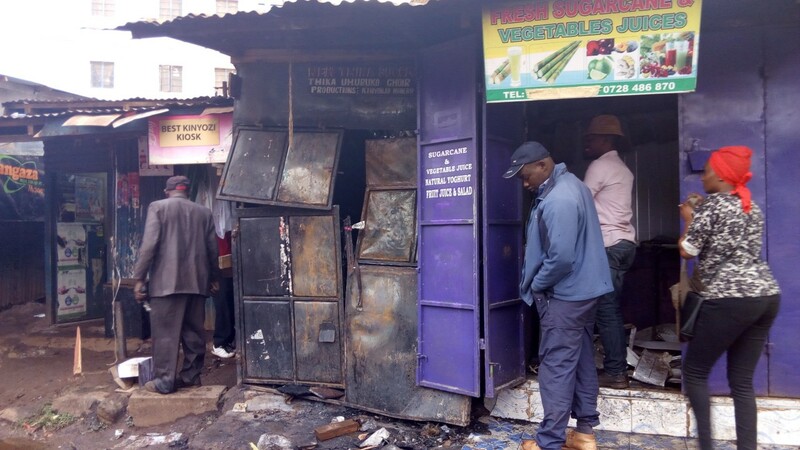 A trader in his late 50s lost on Tuesday lost property of unknown value after two almost simultaneous fires gutted down his semi-permanent kiosk at the Thika Main bus station and moments later, his house at Kiandutu slums caught fire. While narrating his ordeal to Thika Town Today on Wednesday morning, Mzee Kinyanjui Waweru was in loss of words as he tried to comprehend about his loss. According to him, he closed shop at around 6:30pm Tuesday after having switched off the main electricity switch to his shop. Upon arriving home in Kiandutu, he received an emergency call notifying him of an inferno at his electronics shop at the main bus terminus. “I immediately boarded a bodaboda and rushed to town. On arrival, I was greeted by a very huge flames engulfing my shop. I never managed to salvage anything from the shop,” explained Mzee Kinyanjui. He disputed rumours going round that the fire emanated from an unattended welding soldering bit from his shop. “I left everything intact. That’s not true. I do my repairs on the desk next to the door and there is no way I could have left the welding bit on since I have to remove the desk before opening the door to leave. And by then, I am forced to remove all the things on the table,” he said. Kinyanjui reckons that as they were putting off the fire, a neighbour in Kiandutu called to inform him that his house was on fire. “I really can’t explain this. As we were busy putting off this fire, I received another call from Kiandutu saying that the house is on fire. My neighbour’s kid incurred some burns and was rushed to hospital. Even though they claim that it might have been caused by a burning stove, the coincidence is a mystery to me,” he said. The TV fundi suspects some foul play in this incident, suspecting that the fire might have been ignited by someone to destroy some of his documents. “I have some court case related to our late parents’ rural shamba with some of my brothers and in fact I spent the better part of today dealing with the matter. I suspect someone might have burnt this shop hoping to destroy the documents so as to cripple my evidence,” he said. His daughter Ann Wairimu Kinyanjui reckons that they lost everything including electronics belonging to her father’s clients which were still under repair. She called on well-wishers and the government to come to their aid and assist them get back on their feet again. The inferno also affected part of the neighbouring food kiosk and destroyed part of it. Traders who neighbour the affected shop thanked the Thika fire fighters for their quick response which they said helped to prevent the fire from spreading to other structures. “The fire brigade arrived exactly 8 minutes after the incident and did a great job to contain the fire. Otherwise, it would have been worse as it was threatening to spread to all these shops you see here,” said one trader who operates a kinyozi next to the electronics shop. He also praised the police for ensuring that thieves didn’t cause more harm by breaking into shops whose owners were not around. However, they condemned some people who took advantage of the incident to steal from their kiosks as they pretended to save their wares from being consumed by the fire. Thika West OCPD Willy Simba assured the affected traders that they would do thorough investigation to ascertain the real cause of the fire.